Decorate your home or class room with this great Recycled Snowman! It's fun to create your own snowman especially from recycled materials! Preschoolers may need help to do the tying, but they'll have lots of fun crumpling the paper and decorating their snowman! 1. Crumple up old scraps of white computer paper and fill a plastic bag (other plastic bags make good, recycled, filler too). 2. Tie the handles of the bag together and flip over - the ties sit on the bottom. 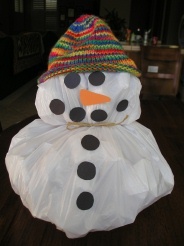 Wrap a piece of yarn or twine around the plastic bag and tie tightly, this will separate your snowman's head and body. 3. Cut out circles and a triangle nose. Tape or glue the shapes onto your snowman. Look around for old hats and scarves to dress him up! Some children like to decorate the snowman over and over again, so we suggest that you roll up masking tape and put a piece on each shape so that they can be put on and removed easily!